Merry Christmas and Happy Holidays! Another short day today to burn some time to avoid arriving in Wellington long before certain family members. Doesn’t exactly feel like Christmas time: with the exception of some rain this morning our day was quite warm and muggy, with plenty of sunshine in the afternoon. We took a half day in terms of distance, but with a nice Hearts plus Lunch break at around 11:00 AM we managed to stretch the day out a bit. We’re still ahead of schedule so figured another light day down the coast would be a great way to spend our Christmas. We woke up at around 8:00 AM. Our Christmas present to one another was unanimous support of a sleep in. We got packed up and walked the rest of the river track onto the coast. 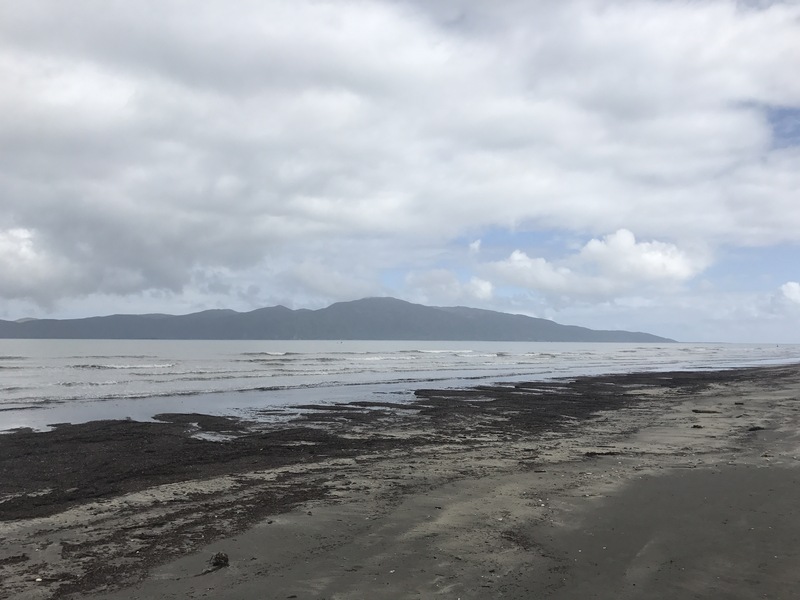 We wound through the boardwalked estuary track which brought us out onto Paraparaumu beach, where Shepard quizzed Sam on his bird knowledge. Along the way we stopped occasionally to chat with locals wondering where we’d walked from. Plenty of congratulations and awesome dogs filled our morning. We stopped for lunch by a seaside bar and grill which was closed for the holiday. At their picnic table we ate meatstick and cheese wraps plus some peanut butter and scrummy trail mix. We followed lunch with some more hands of Hearts, which Sam still dominates. After lunch we made quick work of the remaining beach walking aided by group Harry Potter reading. Off the beach, we had a beautiful hilly foot/cycle path left between us and the Paekakariki HP. 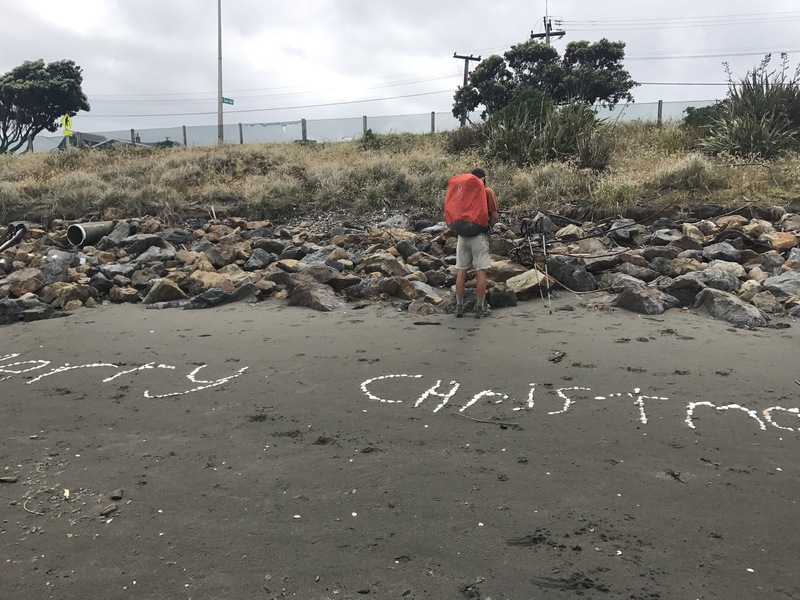 Once we entered Queen Elizabeth park, we saw some Kiwis celebrating the holidays properly: barbecue picnics, opening presents by the beach, music, and big families. Quite happily to be celebrating Christmas with my three favorite living-mates. 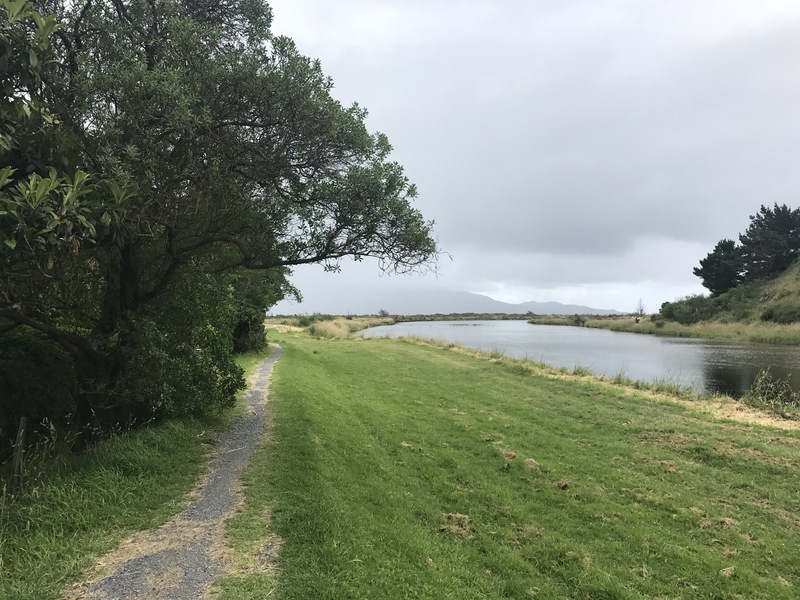 Once we made it to the park, we set up tents and decided to walk toward the Paekakariki train station and head one stop North toward Paraparaumu (which we passed just east of on our beach walk today) and find a place for a sweet Christmas dinner. We learned that in New Zealand, public transport is free of Christmas day! To our dismay, everything in Paraparaumu was closed. Everything, that was, but a small Indian Takeaway shop from which we each ordered some curry, rice, and naan. 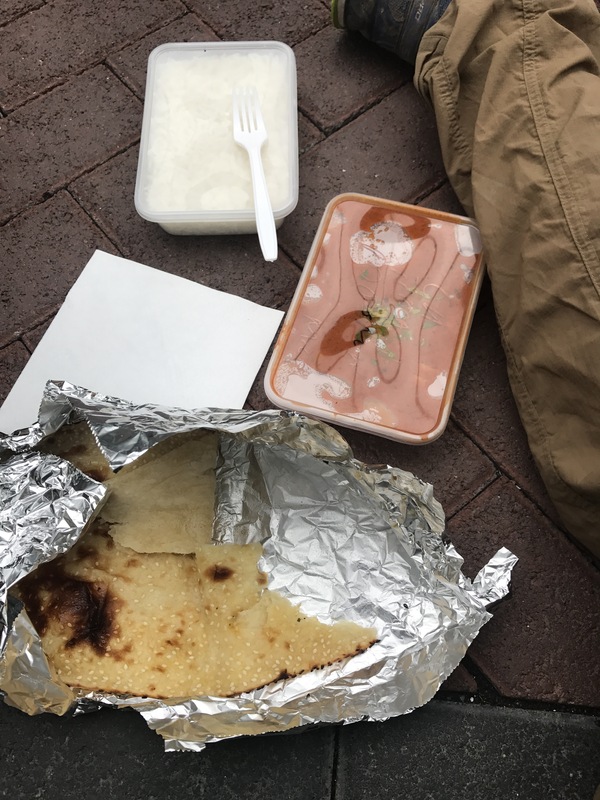 We ate on the ground on a brick walkway outside a closed minimall. Couldn’t have been happier with our celebration. After another couple orders of naan, we hobbled our full selves to the train station, and headed south toward Paeakakariki. Funny that if we stayed on that train, we’d have pulled into Wellington in less than 45 minutes. We played Hearts and read Harry Potter to close out the day, just before some kind strangers offered up the rest of their cake from Christmas dinner. Now we’re ready to sleep, and cut the remaining distance between us and Wellington in half tomorrow. I love walking with these dudes, and am so grateful to have spent my holiday with them. As we reach the end of the North Island, I thank my lucky stars we have a whole another Island left. Happy holidays!